We'll keep you on your feet! Indigo have some fantastic deals across their range of Anti Slip Tapes and Non Slip Products, get in touch today on 01268 768 768! Home / News / Product News / We'll keep you on your feet! We'll keep you on your feet! What is Anti Slip Tape or Anti Skid Tape? The size of the grit is less important than the slip resistance. If the coating is too thick on top of any abrasive destroys its effectiveness by drowning the sharp points that provide wet traction. Our technology and quality control, together with use of tough aluminium oxide particles (much more durable than silica sand) result in high slip resistance as well as excellent durability in our anti-slip tapes. These tapes are absolutely perfect for areas where the tapes will be submerged in water such as around swimming pools, swimming pool steps, bathrooms, cloak rooms, changing rooms, wet rooms etcx. 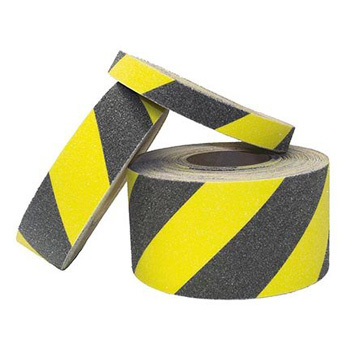 Our Standard Aqua-Safe Water Safe non-abrasive anti-slip tape is perfect for barefoot areas and food preparation areas as it is much kinder to bare feet than our Safety Grip abrasive anti-slip tape and is a lot easier to clean! The slip resistance of Aqua-Safe is still very good, but Coarse non-abrasive anti-slip grip tape has phenomenal wet slip resistance! Testing on human subjects shows that a heel slip of three inches is 50 percent likely to result in a fall. Distance between anti-slip tapes in the direction of travel should therefore be no more than 1 1/2 inches. Gaps between anti-slip tapes should be perpendicular to the direction of travel.